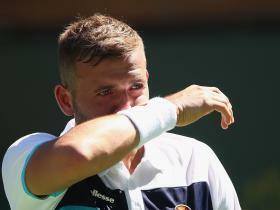 Dan Evans returns to competition here this weekend having served his 12-month suspension for a drugs offence and insisting that he will never make the same mistake again. The 27-year-old from Birmingham was banned last year after testing positive for cocaine. “If you saw the ruins it left behind, just failing a drugs test, never mind what that does to people, you’d be pretty confident I won’t take that drug again,” Evans said as he prepared for his first match in the qualifying tournament for next week’s Glasgow Trophy Challenger event. Evans, who has been given a wild card into the tournament here, has kept a low profile for the last year but ahead of his return agreed to talk on Friday to a small group of tennis journalists. Although he has a reputation as the “cheeky chappie” of British tennis, he was in understandably subdued mood as he talked about his year out of the sport. Evans admitted last year that he had taken cocaine while out of competition, which is not banned. However, he tested positive at last year’s Barcelona Open because he had left some of the cocaine in a washbag which had contaminated other medication. Until two months ago the terms of Evans’ ban meant that he was unable to play at any tennis centres affiliated to the Lawn Tennis Association, which accounts for the vast majority of venues in Britain. He played plenty of golf in that time, but no tennis. He watched some tennis on television but made no attempt to stay in touch with the sport. Evans spent most of the first nine months of his ban living with his girlfriend in Cheltenham and admitted that he had struggled to fill his days, which he would often spend watching daytime television. He said there had been “some terrible moments” in that time. “I was probably the worst boyfriend there has ever been for nine months,” he said. “At the start I was heartbroken not to be playing tennis, but I made the mistake so that’s what it was. I couldn’t do anything about it. Having to break the news about his failed drugs test to those people closest to him had been “a terrible conversation”. He added: “There are so many people when you’re involved in tennis who help you. It’s not just the people who are at the tournaments day in, day out. There are that many people that support you, even if it’s a text at the end of the match or people who stay up when you’re playing in America and are knackered for work the next day. They’re putting their effort in for you to stay up to support you. 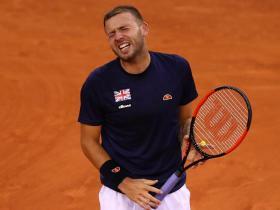 Evans said that he had very little contact with anyone else in tennis apart from Mark Hilton, his former coach, and Leon Smith, Britain’s Davis Cup captain. He also refused to go along with any idea that he had been mixing with the wrong people. “You choose who you hang around with and my friends have never made me do something and I have never made somebody do something,” he said. Evans added: “I took it. I knew beforehand I shouldn’t have. It’s illegal for one thing, never mind me being a sportsman. I obviously knew beforehand. You’d be stupid if you didn’t know you should be doing it.” Had it crossed his mind that he might fail a drugs test? “In all honesty, if you’re taking drugs you’re not in the most clearest mindset,” he said. Evans returned to practice on the first day possible two months ago at Edgbaston. He said he had been blood-tested four times since he began training again and has been helping with the Lawn Tennis Association’s anti-drugs programme. “It’s good to be back on the court, at a tournament preparing for some matches,” he said, though he said he finds it difficult to assess his level of tennis at the moment. “I haven’t hit with many really good players, no one as high as I have been playing before, so it’s tough to judge,” he said. “I feel pretty good in myself, but then there’s nothing like playing matches and getting your match fitness. Evans reached a career-high position of No 41 in the world rankings shortly before his failed test. He is confident that he can recapture his past form if he remains fit, “unless the game has considerably moved on in a year”. He added: “Seeing the older guys do well, that was the only thing I was really looking out for when I wasn’t playing.